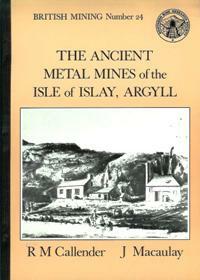 An account of the history and background of mining activity on this remote Scottish island. The volume lists and describes all known mining sites, not only of Lead but also of Copper, Manganese, Iron and Silver. Lead mining sites are identified on the Isles, this proves to be a very interesting and research monograph which identifies these sites what could be found at that time and includes grid references. [USED] British Mining No 43 - Memoirs 1991.